In June 2007, Cirrus Aircraft unveiled the configuration of its new single-engine jet. At the time, it appeared as though Cirrus was jumping on the same bandwagon as other would-be or existing aircraft manufacturers. The apparent market for a single-engine jet, if all the prognostications were to be believed, was going to soar, part of the then-current hype projecting huge fleets of very light jets about to clog up the world’s airspace. The list of would-be single-engine jets was long, yet only a handful have actually flown: the VisionAire Vantage, PiperJet, Eclipse 400, Diamond D-Jet, and Stratos 714. While Stratos’s effort has recently seen renewed activity including flight testing, only one—Cirrus’s SF50 Vision Jet—has made it into production. Bringing a new jet into production is a significant challenge. In the midst of the development program in 2011, at a time when funds to see the project through were scarce, Cirrus was sold by its Middle East-based, majority owner venture capital firm Arcapita to China Aviation Industry General Aircraft, a division of Aviation Industry Corporation of China. The new owners were willing to provide the money to see the all-composite Vision jet through certification and into production. Finally, on Oct. 31, 2016, Cirrus announced FAA certification for the SF50 Vision Jet. In the early days of the Vision program, Cirrus quickly racked up several hundred orders secured by $100,000 deposits. Many of those original buyers stuck with their orders over the years and are now taking delivery of their new jets. Perhaps encouraged by seeing Cirrus overcome the hurdles of certification and initial production, more buyers have stepped up, and the backlog is now greater than 600. Cirrus is taking its time and not rushing the ramp-up process. As with its SR-model manufacturing, jet airframe components are made in Grand Forks, North Dakota, then shipped to Duluth for final assembly. Cirrus expected total deliveries to reach 20 by the end of November. Next year’s target is 60 jets, with an ultimate goal of 125 per year. 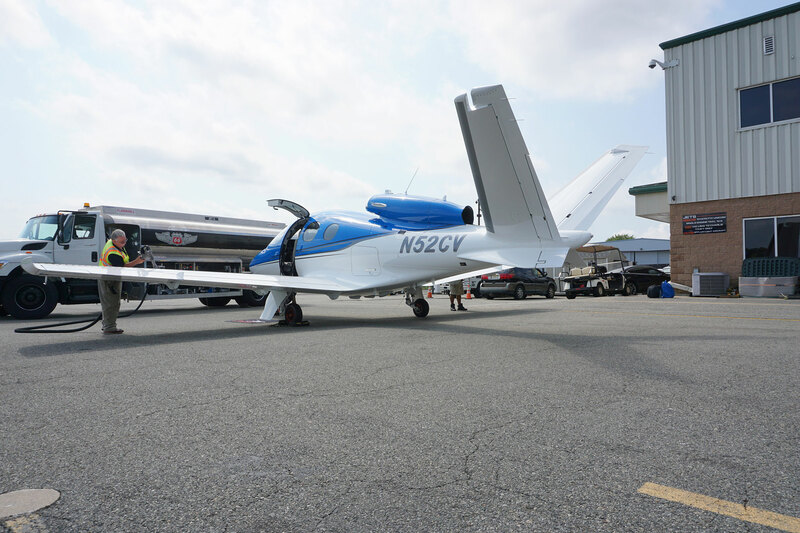 From the beginning, Cirrus touted the Vision jet as “the slowest, lowest and cheapest jet available,” and its projected performance and price targeted owners of single-engine, piston-powered Cirrus SR20s and SR22s who wanted a move-up option in the Cirrus family. Until the jet came along, the upgrade choice was either a multiengine piston twin such as the Beechcraft Baron or Piper Seneca; a Piper, TBM or Pilatus PC-12 single-engine turboprop; or a light jet.